Not to be confused with maturity – which is how long a fixed-income investment lasts – bond duration measures how long it takes, in years, for an investor to be repaid the bond’s price by the bond’s total cash flows. Using duration, you can estimate how much a bond’s price is likely to rise or fall if interest rates change (the bond’s price sensitivity), and it can be thought of as a measurement of interest rate risk. Remember that interest rates and bond prices move in opposite directions: When interest rates rise, bond prices fall, and vice versa. As maturity increases, duration also increases and the bond’s price becomes more sensitive to interest rate changes. Zero-Coupon Bond. Duration is equal to its time to maturity. Plain Vanilla Bond. Duration will always be less than its time to maturity. In general, the higher the duration, the more a bond's price will drop as interest rates rise (and the greater the interest rate risk). As a general rule, for every 1% change in interest rates (increase or decrease), a bond’s price will change approximately 1% in the opposite direction, for every year of duration. If a bond has a duration of five years and interest rates increase 1%, the bond’s price will drop by approximately 5% (1% X 5 years). Likewise, if interest rates fall by 1%, the same bond’s price will increase by about 5% (1% X 5 years). Here’s an example: Assume you want to buy a 15-year bond that yields 6% for $1,000, or a 10-year bond that yields 3% for $1,000. You think interest rates are going to rise over the next three years, so you’ll consider selling the bond before it matures. If you held the 15-year bond to maturity, you’d get $60 each year and would receive the $1,000 after 15 years. If you held the 10-year bond to maturity, on the other hand, you’d get $30 each year and would receive the $1,000 after 10 years. If you buy the 10-year bond, you would only lose 7% (-10% + 3%) if interest rates rise by 1%. The 15-year bond would lose 9% (-15% + 6%) if rates rose the same amount. As such, you’d probably buy the 10-year bond based on the fact that you anticipate rising interest rates. Time to maturity. 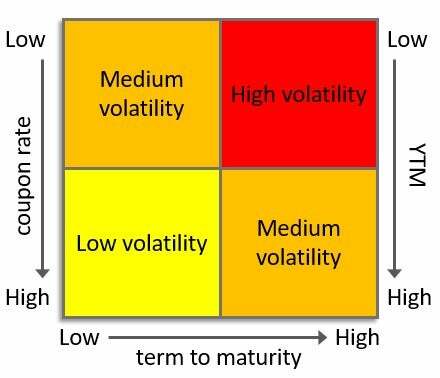 The longer the maturity, the higher the duration, and the greater the interest rate risk. Consider two bonds that each yield 5% and cost $1,000, but have different maturities. A bond that matures faster – say, in one year – would repay its true cost faster than a bond that matures in 10 years. Consequently, the shorter-maturity bond would have a lower duration and less risk. Coupon rate. A bond’s coupon rate is a key factor in calculation duration. If we have two bonds that are identical with the exception on their coupon rates, the bond with the higher coupon rate will pay back its original costs faster than the bond with a lower yield. The higher the coupon rate, the lower the duration, and the lower the interest rate risk. A commonly used method to calculate duration is the Macaulay duration, developed by Frederick Macaulay in 1938. Because the formula is complicated and time consuming, most investors use calculators to do the math. A good one is Investopedia’s Macaulay Duration Calculator. To determine duration, enter the par value, settlement date, maturity date, annual coupon rate and yield, and select the payment frequency. Using the calculator, let’s assume we have a five-year bond with a par value of $1,000 and a coupon rate of 5%. The coupon is paid annually, and the interest rate (yield) is 5%. The calculator shows that the Macaulay duration of the bond equals 4.55 years. 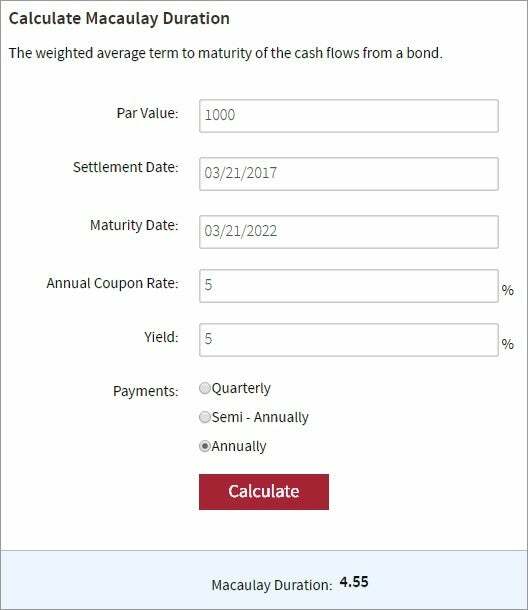 Investopedia’s Macaulay Duration Calculator determines the bond in our example has a duration of 4.55 years. Modified duration. A modified version of the Macaulay model that accounts for changing interest rates. Use Investopedia’s Modified Duration Calculator. Effective duration. A method that uses binomial trees to calculate the option-adjusted spread. Key-rate duration. This method calculates the spot durations of each of the 11 “key” maturities along a spot rate curve. These include the three-month, and one, two, three, five, seven, 10, 15, 20, 25 and 30-year portions of the curve. In general, bonds with a long duration have a higher price fluctuation than bonds with a short duration. As a result, if you want to invest in a bond with minimal interest rate risk, a good choice would be a bond with high coupon payments and a short term to maturity. If you think interest rates will decline, a good bet would be a bond with low coupon payments and a long term to maturity, since these factors would magnify the bond’s price increase. The sensitivity of a bond’s price to interest rate changes also depends on its yield to maturity (YTM). YTM is affected by the bond’s credit rating, so bonds with poor credit ratings will have higher yields than those with better ratings. As a result, bonds with poor credit ratings typically have lower price volatility than bonds with excellent ratings. Changes in the value of a bond are inversely related to changes in the rate of return. Long-term bonds have greater interest rate risk than short-term bonds. As the bond coupon increases, its duration decreases and the bond becomes less sensitive to interest rate changes. As interest rates increase, duration decreases and the bond becomes less sensitive to future rate changes. Duration is a helpful metric that determines a bond's sensitivity to interest rates. The interest rate increase by the Fed was one of the most widely anticipated in history. Here's what it means for bond mutual funds.